for Hepatitis E virus ( HEV) - Anti-HEV IgM and Anti-HEV IgG. Diagnostic activities related to serological detection follow the accredited standard BDS ENISO/IEC17025. The NRL “Hepatitis viruses” is responsible for the organization of national internal control in medical laboratories that perform diagnosis of hepatotropic viruses. 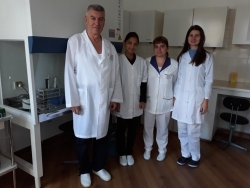 The laboratory participates in international external control of quality assurance and standardization in laboratory medicine, conducted by INSTAND, Germany. The NRL ,,Hepatitis viruses” provides training programs for graduate and PhD students, and postgraduate training for healthcare professionals. Genotype distribution of HCV and HBV in patients with acute or chronic infection, in general population and in risk groups, such as intravenous drug users. Development of post vaccinated anti-HBV response. Distribution and role of HEV infection among non-A non-C viral hepatitis. Golkocheva-Markova E., Ivanova St., Ivanova M., Gekova I., Stoilov N., Konstantinova A., Alexiev I., Stoilov R., Teoharov P. Prevalence of markers for hepatitis B virus infection among patients with ankylosing spondylitis and rheumatoid arthritis. J. BioSci. Biotechnol.,2015, SE/ONLINE:87-90. Alexandrova, E. Golkocheva-Markova, A. Timcheva, N. Yancheva, I. Elenkov, I. Alexiev, P. Teoharov, T. Varleva, M. Nikolova. HCV co-infection compromising the effects of c-ART – an insight from the HIV-positive population in Bulgaria. IJSR., 2016; 5 (9): 1732-1735. Komitova, A. Kevorkian, M Atanasova, E. Golkocheva. Hepatitis A – foe or friend?, General Medicine [Bulgarian], 2017; 19 (3): 18 – 24.